Our sedentary life styles are really affecting our posture these days. Sitting at a desk, working on our computers and hand held devices and long stretches of driving conspire to create neck pain, headaches and back pain. As we sit fo r long periods, our shoulders round, our head drifts forward of midline and our upper body slouches forward. Our neck and core muscles become weak and our chest muscles become too tight. With forward head carriage, the normal, healthy curve in the neck is compromised. The head is no longer balanced over the body. 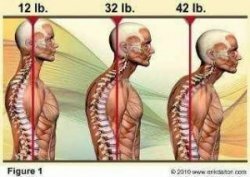 As you can see in the picture (left), the further forward the head is carried, the more pounds of pressure are transferred to the neck muscles, spine, discs and nerves. The forward weight of the head puts tremendous pressure on the supporting structures of the neck. This requires the activation of the front neck muscles into permanent flexion. While the muscles at the front of the neck become tight, including the chest muscles, the muscles at the back of the neck are lengthened and in effect become weakened. In an ideal posture, a vertical line drawn from the top of the head to the shoulder should cross through the center of the ear. You can improve your posture while sitting. Activate your core muscles by maintaining a pulled in belly button, relax your shoulders and focus on "stacking" your head over your shoulders, your shoulders over your hips, your hips over your knees and feet. And when you feel tight, take it as a sign from your body. Get up, walk around and have a little stretch.